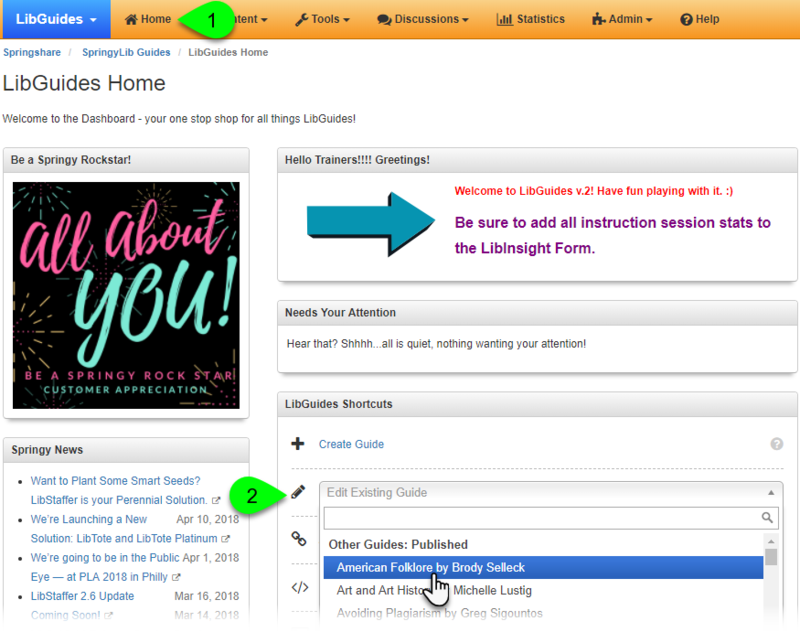 A really quick way to edit your guides is from the LibGuides Shortcuts box on your dashboard. This will display a list of all guides you have permission to edit, with guides you own listed first so you can more easily find them. Not sure if you're on the dashboard? If you've logged into LibGuides, then this is usually the first page you see. However, to get there at any time, simply click on Home in the orange command bar. Then, in the LibGuides Shortcuts box, use the Edit Existing Guide dropdown to select the guide you want to edit. Any guide you own, or to which you've been assigned as an editor, will appear at the top of the list, grouped by status. If you are an admin user or have been give the Edit All Guides permission (CMS only), then you will also be able to select any guide in the system. Click on any column to sort the list of guides in ascending order. Click it again to sort in descending order. Use the filters in each column to limit the list of guides. Only know the guide's title? Try filtering by the Name field. Want to see only your guides? Enter your name in the Owner field. Filters can be combined, too, so you can limit by both Name and Owner, for example. To export a list of all of the guides in your system, click on the Export All Records button and select either the HTML or CSV format. Both export options will include all of the columns from the list of guides (ID, Name, Type, Owner, Group, Friendly URL, Status, Created, and Updated). In addition, the Guide URL will also be included in the export files. 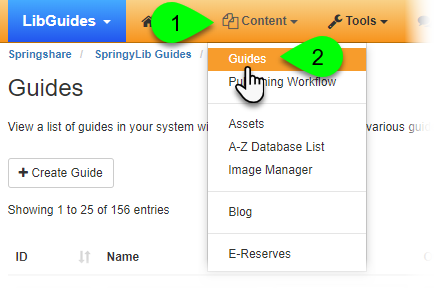 If you are an Admin-level user, or a Regular-level user with the Edit all Guides permission (CMS only), you will be able to view and edit all guides. If you are a Regular-level user, you will be able to view any guide, but only edit those you own or to which you've been assigned as an editor. If you are an Editor-level user, you will only be able to view and edit guides to which you've been assigned as an editor.